A new, state-of-the-art medic unit has been placed into service this week at the Golden Ring fire station. 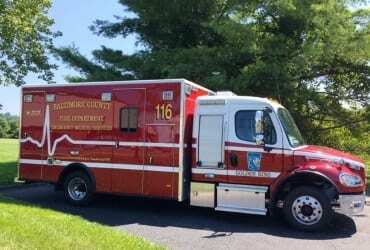 The Golden Ring medic is one of four medic units added to the Baltimore County Fire Department’s EMS fleet in 2015 to aid with the demand for medical service during peak call times. The other career stations that received additional medics to handle demand during peak times were Middle River, Pikesville, and Woodlawn. Middle River’s peak time medic unit (Medic 112) already has been replaced with a new model. Replacements at Woodlawn (Medic 103) and Pikesville (Medic 102) are in production.